(EL PASO, Texas) â€” Border Network for Human Rights members and others in the borderland community will join other human rights defenders around the world in commemorating International Human Rights Day on Saturday, December 10. The Runners for Human Rights will take off from the Chamizal and end in Ascarate Park. 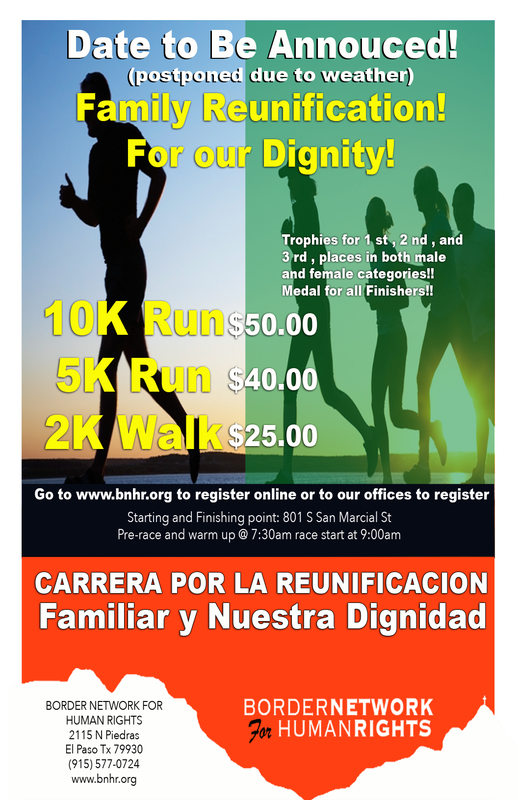 Each runner will represent a unique aspect of the struggle to secure human rights for all who live on the border. The rights include education, access to health care, compassionate immigration reform, work with dignity, housing and Constitutional rights, among others. At each intersection on the way to Ascarate, more runners will join in a growing procession to Ascarate Park, representing the growing movement for Human Rights. The runners for human rights will each represent a unique, common point of struggle that border communities face in the struggle for human rights. They will wear a symbol of their rights. Mario Olivares, a UTEP student, will run in memory of Joaquin Luna, a Texan DREAMer who recently committed suicide over fears that his immigration status would prevent him from being successful. When: Saturday, December 10, 2011 starting at 10 a.m.
Ending at the Rally for Human Rights in Ascarate Park (E).